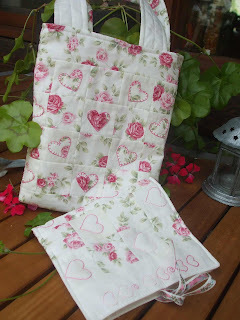 I joined up for Chooky Blue's SCCS Swap and sent to the lovely Dawn. 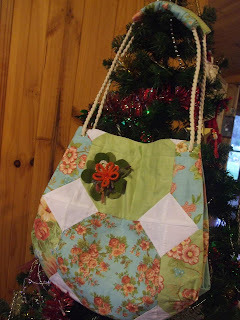 I made her a project bag and needle book from one of my own designs. I also sent her lots of little goodies. I received from Sherry. 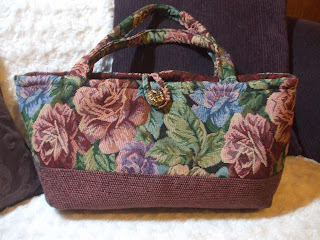 Sherry made me this lovely tapestry bag - It is a lovely design and I think I will use it to carry around my knitting in the winter. Thanks so much Sherry. The advent swap was a success other than a few hiccups I think that most swappers have enjoyed the swap and have made some lovely new friends. My partner was Lizzie. Lizzie made me this lovely bag which I think is made from an April Cornell range? And there is a flower stitched on made from some of those hand dyed woollens that Lizzie dyed a few months back. Thanks so much for being my partner Lizzie. The front porch is finished. What do you think? 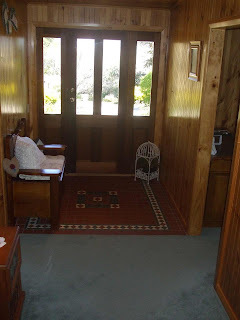 It looks so much tidier and moving some furniture out brightens up the area. Hubby says that I will have this shelf cluttered in no time. Today we have been moving bedrooms around. Amy is having a larger bedroom now and the spare room will be the smallest bedroom in the house which has Tom's bed and Maddie's cot for when they sleep over. I have not taken any photo's of Amy's room as it is a typical girl's room and quiet terrible really. There is not very much going into the garbage bag at the moment so I need to give her more of a helping hand in that department I think. 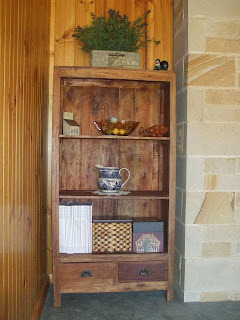 2010 will be the year of "frugal living" here at Mothers Cupboard. It will also be the start of a healthy eating regime in our household. Both Rod and I have put on weight in the past 12 months and instead of using the "D" word we are just saying that we are going to make healthier choices and cut down on our intake. 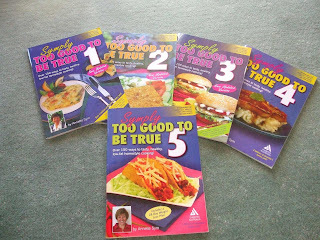 I have been to the supermarket and purchased the basics for cooking from my "Symply Too Good To Be True" Recipe Books. Have you seen these before? They are written by Annette Sym who herself has had a massive weight transformation over the years simply by making healthier choices and cooking from her own developed recipes. The books are recommended for Weight Loss, Diabetes, Heart, Cholesterol and Good Health. 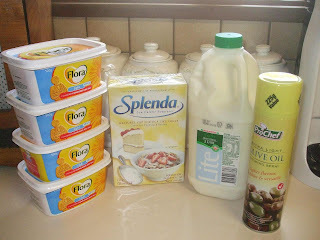 Each recipe has a full nutritional value breakdown per serve and include lots of favourite dishes which are just cooked using healthier choices like Flora Light Margarine instead of Butter or Fatty margarines , Olive Oil Spray instead of cooking in oil, Splenda instead of sugar, Skim Milk instead of Full Cream and the list goes on. There are 5 books in the series and each has recipes for Starters & Light Meals, Vegetables, Seafood, Chicken, Meat, Desserts & Baking. They are available at all good newsagents in the recipe book section for $12.95 each. I have been baking out of these books for quite some time. My frugal living tips will start on Friday. I have lots and lots to share with you over the coming weeks. One of the best things about frugal living is the sense of satisfaction when you either recycle, repurpose or grow something for your home. 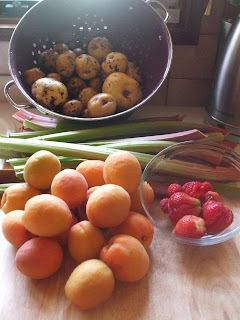 It felt so good this morning to go to the garden and collect today's fruit and vegetables and the cost was just some TLC and forward thinking. To get you starting to think about re-using and recycling join your local Freecycle web site. Have you heard of it before? It is when people offer things that they want to give away. You just e-mail them and arrange for collection. I have given and received so many things on this site. Our 6 goegeous hens came from the Freecycle site as well as some garden pots, a hat box and just recently enough curtains and tracks for my daughters home. I have given away kitchen items, aloe vera plants, porta cot, fax machine and boxes of knick knacks. The only rule really is that there must be no payment - hence the name FREECYCLE. roll on frugal tips, this is my year for being "cautious" ( We want to build a new house so we don't have to live so cramped!!) 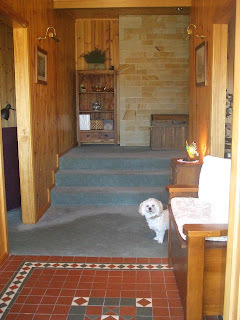 We decluttered when we moved so have given away pretty much everything that we can. You guys did an absolutely amazing job with the Advent Swap, thank you so much for all the organisation, a huge effort and a job well done!! Lovely gifts Fiona, and I wanted to thank you for hosting the Advent Swap. It was so much fun! Happy New Year to you! Must be the time of year to declutter, that's how I'm spending my break. I'm also on a healthy eating regime as well! Enjoy the new year, although a bit too hot for me today! 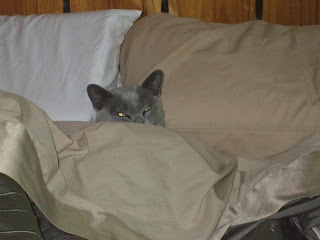 Your cat looks comfy, and I bet you didn't make the bed till the cat moved. I've been connected up to Freecycle for quite a while, and it's great for saving money, and being environmentally aware. Keep up the good work. Just wanted you to know that I put all of my new sewing needles in the very fabulous needle keep that you made for me. I love it!!! Thanks again for everything that you sent to me in the SSCS swap!! !